We all have those recipes we make over and over again, right? The ones we just about crave? The ones we pull out for an occasion. Birthdays, Company? Anniversaries? This Bacon Dried Cherry & Caramelized Onion Stuffed Tenderloin is one of those at our house. It’s an absolute show stopper! If you’re like me, you’ll just look for an excuse to make Bacon Dried Cherry & Caramelized Onion Stuffed Tenderloin. And unless you’re a small family like ours or very reasonable eaters (and it IS hard not to want a second helping of this) you might want to double the recipe and make two! 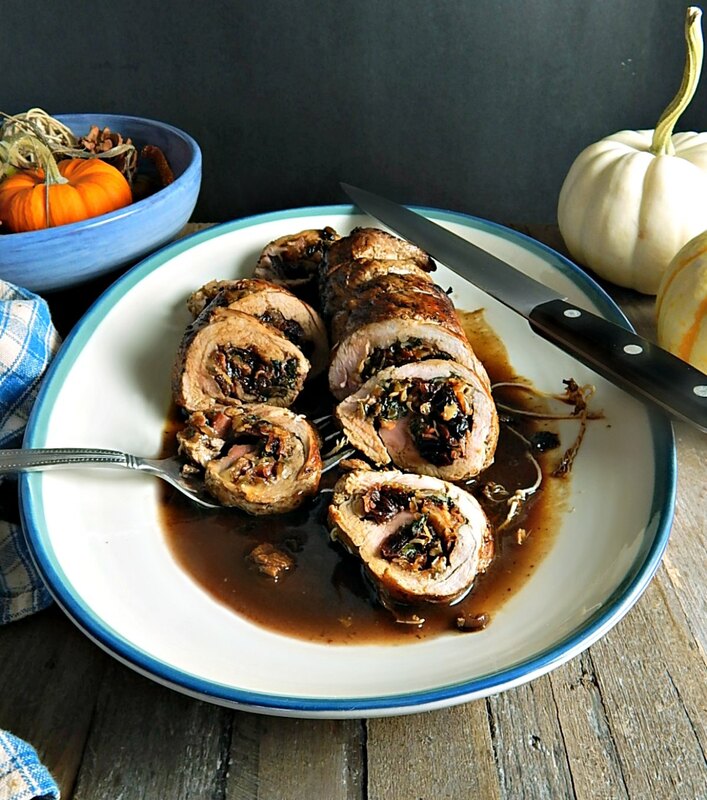 What we have here is pork tenderloin, rubbed & seasoned with the fall spices of allspice and pepper, then stuffed with a bit of bacon, sweet caramelized onions, spinach, and sweet dried cherries – or even better, tart dried cranberries. A touch of grated sharp Asiago binds it together and bridges the flavors together. It’s simply magical. Stuffing and rolling anything makes it special, and stretches a pricier protein. It makes it seem more than the sum of its parts, and Bacon Dried Cherry & Caramelized Onion Stuffed Tenderloin is no exception. What steals the show here is the winey sauce. This was originally a Fine Cooking (2010) recipe and over the years I’ve changed everything but that sauce. Try Sauvignon Blanc then serve the rest of the bottle with the meal. Speaking of serving, I think the absolute perfect thing to go with Bacon Dried Cherry & Caramelized Onion Stuffed Tenderloin is my Pureed Parsnips. Mashed potatoes are great, too, and for your fresher veggies, try Brussels sprouts or a roasted root veggie. See my Hearty Sides and Vegetables A to Z for recipes. There’s no doubt that this is not a super easy, toss out on a busy weeknight meal, but it’s not hard to pull off if you have some time to devote to it. Get it ready ahead if you want, refrigerate, then bring it back out to sit on the counter for 30 minutes before browning and baking. The stuffing is easy but does take about 15 to 20 minutes, and while that’s cooking away and you are cooking your bacon is the perfect time to trim and prep your pork tenderloin. The hardest part of the recipe is trimming the silverskin and cutting the pork tenderloin so it lays nice and flat. Make sure to sharpen your knife and that job goes so quickly and easily! Sometimes I forget until I’ve started the cut, then I have to stop, clean everything up, pull out the knife sharpener and start again. And yes, even the best knives need to be sharpened, especially for a job like this. Just wait until you make this – the flavors from the stuffing are incredible! The aroma of the orange and balsamic! Be patient with that cutting, taking long slices as you turn the tenderloin bit by bit because if you have a decent sized pork tenderloin, you’re going to want to cut it in a spiral rather than straight through from top to bottom, so it lays flat instead of what is basically two half moons connected at the bottom. Cut into the tenderloin about an inch deep and turning the tenderloin, with your knife at an angle, take small slices along the length, keeping the tenderloin at about 3/4’s inch thick. There’s a rough drawing at the bottom of the page, too. The last pork tenderloin I got (first time buying one at Costco) I thought was huge but I opened the package to find two scrappy looking little things. I was dismayed! How could I stuff that? It’s in the pics, below. I couldn’t really spiral cut it but I cut partway into it and then just angled my knife, taking small slices until I had one side relatively flat, then turned to the other side and did the same…it all worked out and it’s the same principle. After your pork tenderloin is cut so it lays as flat as possible, you’re going to gently but firmly pound it out. I use the flat side for most of the pounding and only use the pointed side of the mallet if necessary. Go for about 1/2 to 3/4’s inch thick. This was the scrappiest pork tenderloin I’ve ever seen – but I managed to stuff it! I lay the strings for tying out on my cutting board and then put the tenderloin on top of it, then spread out the stuffing, leaving one long side clear. That makes it easier to roll and stuffing won’t squirt out (or at least not too much) when you get to the end. If you lose any stuffing, just shove it back in. Use a “butcher’s” knot to tie. It’s your basic square not but instead of just one loop at the beginning, take two loops – that keeps the knots from slipping. Make your first two ties at the outer edges, the next in the middle and then just fill in with the rest of the ties. Stuffing laid out. Notice the strings already in place for tying. Tie each end, then the center and work from there. Butcher’s knot (top) is basic square knot (bottom) with an extra twist in the first part of the tying. Pork Tenderloin (at least plain and not pre-flavored) has become harder to find in my neck of the woods. It’s becoming more common to see the dryer and usually much, much cheaper Pork Loin cut down to tenderloin size and labeled “Tender Loin” or some such misleading thing. Don’t fall for it. See Buying & Prepping a Tenderloin for more info. If your pork tenderloin is huge, it’s a sign that you’re looking at the much cheaper pork loin that’s been cut, tenderized and injected with a lot of stuff in an attempt to mimic the juicier and more expensive pork tenderloin so it can be sold at a pork tenderloin price. Most pork tenderloins are smaller, 12 ounces to a pound, and just like beef tenderloin, is a beautiful cut of meat. Unlike beef tenderloin, it’s very cost effective. Look for them on special, especially in the fall. At my store they are often on a “buy one, get one half off” special and since they’re usually put out by specific producers, like Hormel, you might find coupons to lower the price. Coupons are usually a dollar off, and you’ll use two of them for a special like that. I watch for the same kinds of specials when I buy what I call “near deli” cheese (because it’s usually near the deli). Bacon can be potentially pricey, too, so stock up on holidays when it’s usually on sale! It doesn’t take up much room in a freezer and the sale price can be as much as half off. The key takeaway on bacon is to not be brand loyal and be willing to buy what is on sale. Sign up for emails from your fave wine shop or liquor store. Most shops have great sales several times a year, especially in early spring with fantastic deals. It never hurts to check the sales bins if your shop has them, and it’s always a good idea to know who in your liquor store is the wine expert. A good one will ask what you’re serving your wine with, what your price range is and lead you to options you might have never considered. Heat a tablespoon of the olive oil in a 12-inch skillet over medium heat. Add the onions and cook, stirring occasionally, until softened and light golden brown, about 5 – 8 minutes. If needed, add a bit of water to the pan to prevent scorching. When the onions are caramelized, add the orange juice, zest, balsamic & dried cherries, cover and cook over low heat until cherries are plump and onions very soft, about 5 minutes longer. Add spinach and cook, uncovered until spinach is wilted and all the liquid has evaporated, about 5 minutes more. Season to taste with salt and pepper. Leave to cool as you prep the tenderloin. Slice the tenderloin, lengthwise into one flat piece: Cut about an inch into the tenderloin, then using small slices and turning the tenderloin bit by bit, keeping the outside portion as even as you can, cut the tenderloin at about 3/4 inch to one inch, until it lays flat. (Basically, cut it at a spiral.) Place between two pieces of plastic wrap cut side up and pound gently until; it reaches a thickness of about 1/2″. In a small bowl, mix the ground allspice and 1/4 teaspoon black pepper then stir in about 1/2 tablespoon olive oil. Rub the mixture on both sides of the pork and season generously with salt. Spread the stuffing mixture down the center of the cut side of the tenderloin, leaving a generous inch and a half along one of the long edges bare. Sprinkle with bacon & cheese and roll tightly, from the long end without the unspread edge towards the bare edge. Tie with butcher twine at 1-inch intervals. Heat the remaining 2 tablespoons olive oil in an ovenproof 12-inch skillet over medium-high heat. Brown the pork on all sides until golden, about 5 to 6 minutes. Transfer to the oven and roast until an instant-read thermometer inserted in the thickest part of a tenderloin reads 145 to 160 degrees F, 10 to 15 minutes. Transfer the pork to a cutting board and tent with foil. Set the skillet over medium-high heat, add the wine, and deglaze the pan by scraping up the cooked bits with a wooden spoon. Bring to a boil & reduce the wine by about half, 1 to 2 minutes. Add the chicken broth, bring to a boil, and reduce by about half, 2 to 3 minutes. Turn off heat, remove from burner & add butter, gently swirling it around with a fork until melted. Season to taste with salt and pepper. Remove the strings from the pork and slice it into 3/4-inch-thick slices. Serve drizzled with the sauce. I’ll be taking this over to Angie’s Fiesta Friday #137, hosted this week by Loretta @ Safari of the Mind and Natalie @ Kitchen, Uncorked as well as Saucy Saturdays – they’re such a great group of bloggers! Photos & text updated for this post, November 2018. Below are the original photos. You can repin with the new pictures by clicking on the Pin in my social media bar. This entry was posted in Click here for Bargain Meals, Click here for Fabulous Food Posts and tagged Alcohol, asiago cheese, Bacon, Balsamic Vinegar, Bargain Meal of the Week, Cheese, dried cherries, Dried Fruit, Fine Cooking, Orange, Pork, Pork Tenderloin, Spinach, Vinegar, Wine. Bookmark the permalink. may I ask what were your side dishes for this main course? HI Christy, you can make this all ahead. If you make it totally all ahead, make sure the stuffing is completely cool before you roll it for safety issues. You don’t want to put the stuffed and tied tenderloin in the fridge with the warm stuffing because it will take awhile before the inside gets cold. Cut down the length straight down about an inch, then turn your knife at a slight angle and slice a little at a time so you have kind of a spiral effect. Tenderloins aren’t very big so what you’re aiming for is an even piece of meat. I dded kind of a rough drawing. Thank you! Going to make it next week for my parents 59TH Wedding Anniversary Dinner!! How wonderful!! I think this is a very special dish and would be perfect for a special day like that!! You might want to make more than one, lol!! Lawd woman! We have the exact same palate! YUM! Thanks!! Lol! I love your blog, too! You’re causing me a backlog of recipes to make!! OMG Mollie. This looks amazing. You are torturing me. The pics are perfect and making me hungry. I can almost smell this roast sizzling. Lol! It is a fave, for sure. I was really worried about the pics, but I’ve tried many times to get pictures and it seems we’re always just waiting to dig in! What a tantalizing list of ingredients in your pork loin. The addition of Sauvignon Blanc did it for me 🙂 Love the presentation, it looks ever so juicy and grand enough to serve up for company. Well done! Thanks for bringing this flavorful and succulent dish to Fiesta Friday. It is a bit of this and a bit of that, and you can never go wrong with a glug or two of wine, lol!! Thanks again for hosting!! Mmm! I love stuffing pork loin. i haven’t done it since last fall, it just seems like the thing to do this time of year. Your filling sounds absolutely amazing. I can’t wait to give this a try! This tenderloin looks succulent and very tasty. I need to get over my “meat and fruit” aversion. I’ve seen so many good combos like this over the years and I am sure it is fabulous! I didn’t know that was an issue for you – this is fab and you should try it! Just sayin’ lol!! That was supposed to be “meat” but I am sure you figured that out. Hate typos, lol! Wow, thats spectacular. Beautifully done. Thanks! I’ve been wanting to put it on this blog forever but I’ve never gotten the photos to turn out how I’d like them to – it really doesn’t do it justice! The bacon just sets it off so nicely!